Trump Lashes Out At FBI After 'NY Times' Reported On Inquiry Into His Intentions The president didn't question the report, which said counterintelligence officials wondered if he was a national security threat. Instead, he said he was "FAR tougher on Russia" than other leaders. On January 22, 2017, President Trump and James Comey, then director of the FBI, shake hands. President Trump, amid the longest shutdown in U.S. history, has channeled his wrath at the FBI, following a New York Times report that the agency launched an investigation into whether he had been working on Russia's behalf when he fired James Comey as director of the bureau in May 2017. Trump took to Twitter on Saturday, beginning a stream of angry tweets around 7 a.m. He did not refute the Times' reporting but instead went after the integrity of the nation's main federal law enforcement agency. 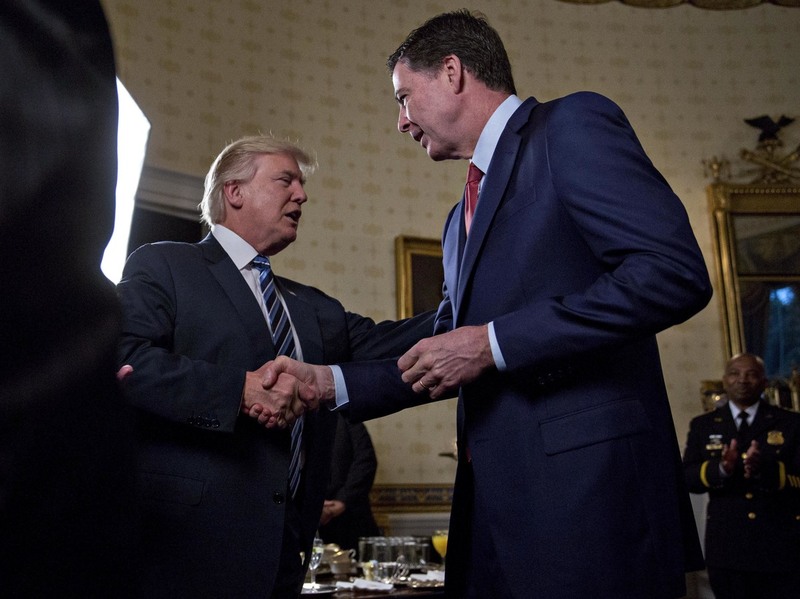 "Wow, just learned in the Failing New York Times that the corrupt former leaders of the FBI, almost all fired or forced to leave the agency for some very bad reasons, opened up an investigation on me, for no reason & with no proof, after I fired Lyin' James Comey, a total sleaze!" he wrote. He went on to say that the firing of Comey was a "great day for America" and called him a "Crooked Cop." Trump named Comey, former Deputy Director Andrew McCabe, former Special Agent Peter Strzok and former FBI attorney Lisa Page as "just some of the losers that tried to do a number on your President." Trump also used the platform to allege that Comey is being "totally protected by his best friend," special counsel Robert Mueller and his team of prosecutors who are investigating Russian interference. In December, Comey told lawmakers that he and Mueller are not friends. "I admire the heck out of the man, but I don't know his phone number, I've never been to his house, I don't know his children's names," he said to members of the House. He also denied being familiar with Mueller's team. White House press secretary Sarah Sanders denounced the Times report on Friday. "This is absurd," Sanders said. "James Comey was fired because he's a disgraced partisan hack, and his Deputy Andrew McCabe, who was in charge at the time, is a known liar fired by the FBI. Unlike President Obama, who let Russia and other foreign adversaries push America around, President Trump has actually been tough on Russia." The Times reported that U.S. counterintelligence investigators were concerned that the president's actions were a possible threat to national security. They also wanted to determine whether the president "was knowingly working for Russia or had unwittingly fallen under Moscow's influence." "The investigation the F.B.I. opened into Mr. Trump also had a criminal aspect, which has long been publicly known: whether his firing of Mr. Comey constituted obstruction of justice. "Agents and senior F.B.I. officials had grown suspicious of Mr. Trump's ties to Russia during the 2016 campaign but held off on opening an investigation into him, the people said, in part because they were uncertain how to proceed with an inquiry of such sensitivity and magnitude. But the president's activities before and after Mr. Comey's firing in May 2017, particularly two instances in which Mr. Trump tied the Comey dismissal to the Russia investigation, helped prompt the counterintelligence aspect of the inquiry, the people said." An inquiry into Trump wouldn't have been launched by a single, angered agent but "collectives probably numbering in 10 to a dozen different people," former FBI agent Clint Watts told NPR's Weekend Edition. "There would have to be wide agreement to move forward on this." Watts added, "We just don't know what the special counsel Mueller probe knows. And I think it's important for America and everybody as a whole to get to the bottom of this so we can move forward as a country." According to the Times, Mueller took over the investigation when he was appointed. The report says it is unclear whether Mueller is pursuing the counterintelligence case. "I have been FAR tougher on Russia than Obama, Bush or Clinton," Trump said in one of his tweets on Saturday morning. "Maybe tougher than any other President. At the same time, & as I have often said, getting along with Russia is a good thing, not a bad thing. I fully expect that someday we will have good relations with Russia again!" According to a court filing this week, Trump's onetime campaign chairman Paul Manafort shared polling data during the presidential race with a business associate who has links to Russian intelligence. The information was made available when Manafort's defense lawyers submitted a legal brief with botched redactions. On Tuesday, seven House Democrats sent a letter to U.S. Treasury Secretary Steven Mnuchin asking why the Trump administration was planning to ease sanctions against companies controlled by Russian oligarch Oleg Deripaska. The billionaire was sanctioned in April and has ties to President Vladimir Putin. Mnuchin gave a closed-door briefing to lawmakers on Thursday.